PART 1: This section explores the tools that are used for the manifestation techniques in this book. The tools covered are as follows: Affirmations, Creative Visualization, Expectation, Gratitude, and the Practice of Receiving. You should take the time to carefully read this section even if you are familiar with the Law of Attraction and the power of intention. This section contains a number of insights and explanations that may have been missed by other authors and teachers. For example, the Practice of Receiving is a powerful tool that can help you attract a lot of money, yet many Law of Attraction books do not mention this important exercise. In addition, I have included some helpful information about gratitude and affirmations as it relates to manifesting money. Affirmations of words, thoughts, feelings, and actions are also covered. Finally, the most important element of any manifestation technique is creative visualization, which every Law of Attraction lottery and contest winner has used to win prizes. PART 2: This section includes the manifestation techniques used by the winners who were interviewed for this book. Each winner, including the author, is introduced and his/her manifestation exercise is documented to reflect the exact steps taken to win lottery prizes. No changes have been made in order to preserve the integrity of each winner’s method. PART 3: This is a Question and Answer Section that covers the most important questions about the manifestation techniques in this book. The answers have been provided by the lottery winners who were interviewed. This Question and Answer section will provide clarity and direction for those readers who are committed to using the Law of Attraction to manifest lottery prizes. The questions included in this section cover topics such as: Should I buy lots of tickets? How will I know that my intention will work? How long will it take for me to get results? What part does luck play in manifesting lottery prizes? In addition, a host of other important questions are discussed. PART 4: This section contains helpful tips and suggestions that will explain how to implement the following manifestation techniques and how to make the most of them. 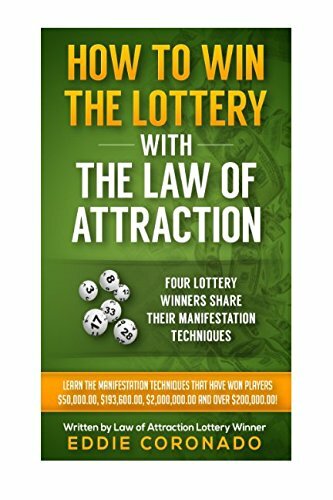 It also contains information regarding the common denominators of the winners’ daily action plan in order to provide a clear understanding of the mental and emotional habits that are necessary for manifesting lottery prizes with the Law of Attraction.